DeSilva-Johnson leads a panel discussion as part of Print! Document::Exhibit A, an exhibition of work from the Operating System’s Print! 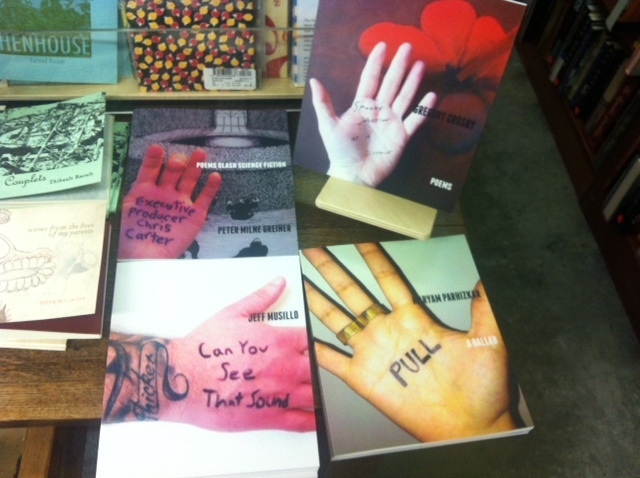 Document chapbook series. 4) When you follow the link “About the OS” on your website, the text it leads you to is as much about business and entrepreneurialism as it is about art or writing. You write, “I want you to not only MAKE, I want you to THRIVE. One often finds, however, that the available ways of SUPPORTING our expression, without having to lead double lives in other jobs or being destitute, are often non sustainable. What if we could shift our bad habits, and model new ones for ourselves and each other?” Can you elaborate on that? In what ways is the OS involved in teaching artists and creators to become self-sustaining economic entities? I’ve learned a great deal from many years of engagement in the social technology and entrepreneurship communities, and there is a bounty of language and methodology there which creative practitioners could learn so much from. In particular, the idea of a “Peer to Peer” network, and of “Open Source” practice is at the heart of The Operating System’s design: how can we pool our resources and maximize the value of the work we’re already doing to make ourselves more effective and efficient, both individually and as a community? I’m a systems thinker, and I think a lot about both individuals and communities organically, like organisms. I consider energy expenditure a lot, and the ways in which our systems are inefficient energetically; for instance, redundancy: how many people are making the same mistakes in operating a press, running a magazine, in using social media, in buying materials, in submitting to magazines, et cetera. Where are there spaces to model for each other effective behaviors, by sharing the mistakes we’ve made? That’s what I was asking when I designed the platform. A lot of our problems are self-perpetuating, and much of it comes from how we label ourselves. We say, “I am a writer” or “I am a publisher,” but really we’re all entrepreneurs, and much of what we need to learn to create the space for ourselves to be a better writer or artist or publisher is practical. I nerd out on the regular reading Fast Company, Inc., and Wired, but I know this isn’t standard practice in our community – there’s long been a sort of conceptual Church and State divide between the creative person as “creator” who is somehow sullied by intellectual involvement in monetary matters, which I think is damaging us enormously. There is a huge lack in our academic standards for practical decision making and best business practices in our creative professions, and part of the reason I was not as heartbroken as I thought I would be when I left a decade of service teaching at CCNY has been because I see myself, through the OS, as teaching more than ever. Much of our learning has always gone on outside the institutional setting, but as the structure of our institutions struggles to support a highly networked culture – and with student loan financing at an absurdist peak – now we’re really seeing the efficacy of many of our pedagogical traditions blown wide open, and much more acceptance of learning via other venues as a legitimate option. We often host organizations and individuals in the practice of offering options to traditional education, and hope to continue to serve as a conduit for this shift. Last year I curated a show at LaunchPad in Brooklyn, “Exhibit A: Re/Production and Re/Representation,” around which we organized a panel of practitioners, entitled “Strategies for Resilience for the Artist as Accidental Entrepreneur” – a phrase I coined also quite by accident at the time, which has become very much a touchstone for all the OS’s projects. For Exhibit A, we reproduced images of two and three dimensional visual art, stills from multimedia art, and text from artists and writers in our community – creating highly branded, aesthetically uniform posters in a variety of scales, postcards, and a giant range of branded, printed commercial products (tshirts, mugs, onesies, flasks, etc) via an online store – basically everything you’d see in a museum shop. In essence, it begged the question: who is “allowed” to prosper via commercial reproduction? Why do we judge so harshly – and/or see as less “pure” or “high” art practice those who create commercial products from or via their work? Whether or not this concept is changing – or being more securely hammered in via cultural divisions in:re participants in Etsy, Threadless, Society6, or similar – was very much a hot topic. Our roundtable discussion was incredibly lively – these are issues at the core of our practice, with which we struggle constantly, as we work multiple jobs, finance materials, and handle complex tax hurdles, not to mention all those life issues that everyone deals with. Especially in a city like New York, it’s often said, perhaps because there is so much money visible, and because the dream of having some of that shift in your direction to support your practice is so near. I find that creative practitioners struggle with Open Source modelling because, ultimately, it requires a mental shift as regards “ownership” of our ideas, and deeply engrained fears about the scarcity economy — and, really, about other people. There is often an underlying hostility bred of exhaustion and desperation that presents itself in the guise of self-preservation, in commonly held practices regarding intellectual property and exploitation of our work. Which is understandable – but not a permanent condition, I’m happy to report. Part of the OS’s goal is to show how our fears and common practices are related to an outdated, conditioned, very much culturally specific relationship to money, and to introduce creative practitioners to not only theoretical but also practical alternatives. We saw a huge shift, even if the media downplays it, with self-actualized networks via the Occupy Movement, who continue to have an enormous impact – take Hurricane Sandy relief efforts, for example – and we want to give our audience the tools to make similar shifts happen for themselves and their personal networks. You’ll see links to contemporary public intellectuals like David Graeber and Charles Eisenstein in our editorials, because of the potential utility there. Money can be understood simply as another form of energy input – something we trade for the ability to work less in other hours of the day, something that can be exchanged for goods or food or other inputs. Nearly all of our choices as creative practitioners – and often the choice of whether or not to participate in creative practice at all – are directly affected by our relationship to money, and our fears surrounding it. There’s often been a real spiritual dampening in the cultural mores regarding the artist as “selfish” or otherwise not “productive” – and it’s incredible to really see from the outside the powerful, illusory, hold of these norms once you’ve escaped this particular rabbit hole (how I spent my last decade, the memoir). I’m interested in this as the heart of the matter – the impact on all of our work that a real shift regarding sustainable economic practices and models (as well as a new emotional relationship to art as service) would have is astounding, if you think about it. Once we start feeling like we’re not being irresponsible, but rather quite the opposite, by engaging in this work, then we can start thinking and talking about color and light and language again, like a breath of fresh air. 5) For me, one of the most exciting things about the OS’s web presence as well as its print publications is the wide variety of styles of art, music, and writing that you offer to your readers. Can you say a little bit about how an organisation/publication like the OS can avoid falling into the kind of homogeneity that can result from over-curation or a too-close association with a “scene”? Not to repeat myself but one of the central intentions of the Operating System is the encouragement of creative play via a reconsideration of our narrative: a frank, humble, good-humored evaluation of the way we label ourselves and others, and how greatly we often delimit our possibilities by doing this. I don’t think anyone intends to get stuck in a scene, or in a creative rut representative of the stylistic preferences of a scene, but I do think that many people are lonely, scared, and exhausted… and will take support and a feeling of community wherever they can find it. We’re often very defensive until someone proves to us that we’re not going to get hurt or taken advantage of. I don’t care what you look like or how old you are or how many accolades you’ve received or what medium(s) you choose to express yourself via, what I do care about is that you choose to express yourself creatively – I want to strip us down to this commonality, which really is a very courageous and awesome choice that all of us are making. The more that we can see this choice as a place for connection, rather than “protecting” ourselves by subjecting eachother to a litany of judgements based on association, aesthetics, and so on, the better off we’ll be. Creative affinity happens in the strangest and least expected places – perhaps with someone who doesn’t speak your language, or someone 30 years your senior, or someone who dresses in a way you absolutely abhor. But the point is this: we’re conditioned for so many reasons to behave this way – I’m not exerting judgement on us for doing so, I just believe deeply that there is a better alternative. So I work to model and encourage an alternative, by creating opportunities for (and making visible) collaborations between unexpected groups of people, across disciplinary boundaries, and in unusual spaces. By being able to demonstrate this parallel mode of creating and collaborating, the OS practices what it preaches – and prove its viability. The more positive experiences people have with our publications, within our workshops, and participating in our various series, the more courage they have to behave in a manner perhaps previously unfamiliar, encouraged by the lack of negative outcome. Breaking away from stylistic homogeneity or from a limiting association with a scene is tricky – and also contextual dependent. I don’t think homogeneity or scene affinity is necessarily bad – as long as its intentional on the part of an editorial staff, and not a side-effect of dependency and/or fear. The fear that breaking away from a proven formula will lead to a drop in popularity/success is pervasive in our culture, and it’s no surprise – how many examples can you think of wherein a person, organization, or group took a risk and changed careers, mediums, aesthetics, approach, and got roundly slapped in the face by the media as well as in several billion personal conversations? “Stick to what you know, bro” seems to be the standard chide, so it’s not shocking that organizations and individuals hungry for recognition have trouble leaving a safe zone of acceptance to branch out in new or unexpected ways. A general attitude of encouragement and a transparent acceptance of certain foibles as par for the course goes a long way: people will often treat you the way you treat them. Reach out to all sorts of people who interest you from all sorts of scenes and engage — tell them you think their work is great, and mean it. You’d be surprised how far genuine interest, attention, and intention goes. 6) Say a little bit about the OS’s relationship to collaboration. What are some of the ways that artists and writers who might be interested in what the OS does can get involved with the project? From the outset, an atmosphere of collaboration has been essential to the OS. In part, this has been a response to the impersonal, unsatisfying relationship all of the founding members have had to the submission process – where even an acceptance can have minimal human contact. We want creative practitioners to feel freedom and human connection within our community, and that they have our support in all ideas brought our way: that we will offer frank and practical guidance, a forum, a platform, and connection to others with similar practices/agendas to the best of our abilities. My business card says, “I am a conduit for universal energy,” and I take this very seriously indeed. Whenever possible, we have created opportunities for engagement and collaboration among contributors both online and off; for instance, we’ve hosted a live Collaborative Content salon to which all accepted PRINT contributors (past and current) were invited in order to encourage them to cross-pollinate, connect, and create collaborative pieces together. Our last cover was created collaboratively, live online via a “layer volley” between two designers in Colorado . Our launches, too, often include a workshop, game, or craft of some sort so that audience members and participants alike are truly engaged and encouraged to become (and remain) involved community members. There is tremendous possibility within the many projects and platforms of The Operating System for creative people of every type. If something we’re working on strikes your fancy, if you have work you’d like to host on our site, if you’d like to submit to our upcoming issue, if you want to connect us up to similarly minded folks, if you want us to do a workshop or salon with or at your venue, if you want to talk about publishing your project (or my goodness if you’d like to fund us because you think this work is important) please do not hesitate to email me at lynne@theoperatingsystem.org. 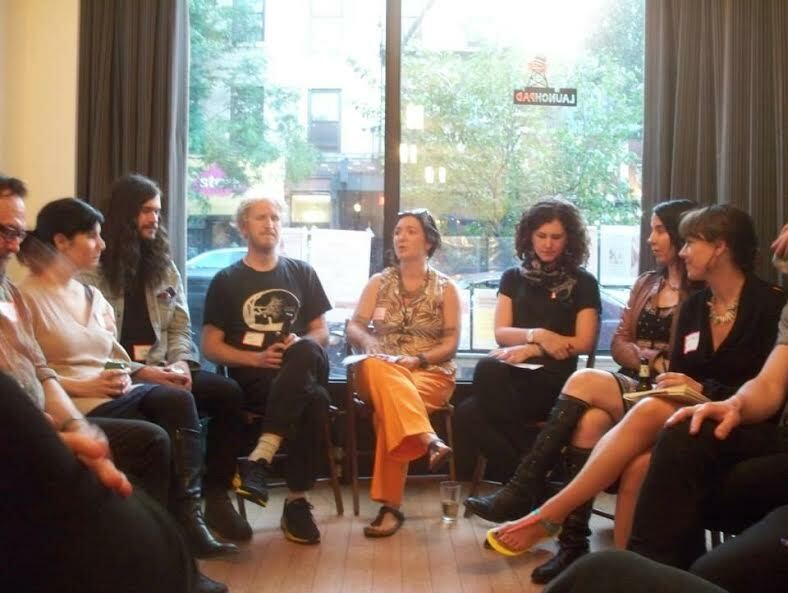 1) In addition to the chapbooks and literary magazines that we sell at Book Culture, the Operating System also has an extensive web presence and hosts readings, exhibitions, and pedagogical events in the non-virtual world. To the extent that it’s possible to do so, can you give an idea of the current scope of the project known as the Operating System? Yes – you could say that the OS’s most enduring, ongoing, tangible output is the wide variety of creative content always going up on our website, much of which falls into these series: Awesome Creators, Field Notes, RE:CONversations, and our annual Poetry Month Celebration (in which 30 creative practitioners contribute a personal account of a poet’s influence on their life and work every april, next year will be the 4th). Our web platform is also the place where our commitment to all creative disciplines (as well as to creative entrepreneurship and peer-to-peer/open source practice) is most visible. We also “host” content for creative practitioners, events, and organizations – meaning that we understand our role as a communication platform, and try to encourage practitioners to better use the web to their advantage by posting (or re-posting) original content they want to drive traffic to on the OS rather than on (or solely on) their personal blogs or websites, which serve a different purpose and receive a different kind of attention. I’ll talk more about the type of sustainable creative practice “modelling” this represents later. As you mention, we are always hosting and participating in community events, which include readings, workshops, salons, curated shows, roundtables, bookfairs and more, and partnering with various organizations to catalyze creative possibility. 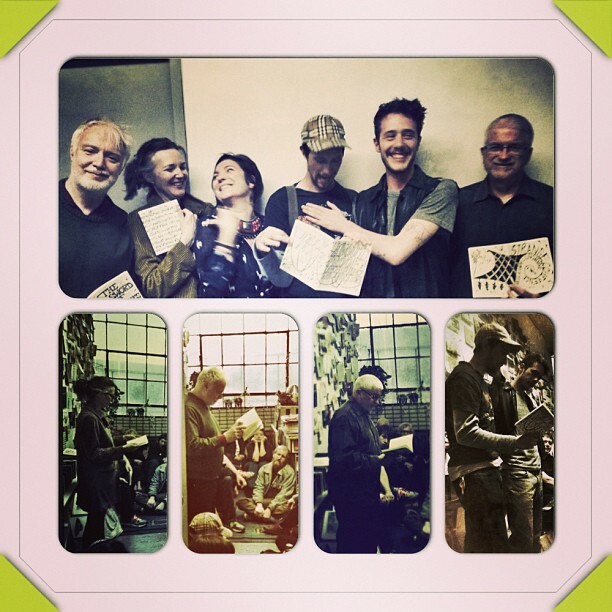 We just had a delightful, standing room only reading for our 2014 Chapbook Series at Pete’s Candy Store, and we’ll be hosting a reading at the NYC Poetry Festival in July, tabling and hosting a reading at Boog City in August, and have two collaborative curated exhibitions coming up in the fall. We’re actively engaged with the nascent US Department of Arts and Culture, a citizen artist organization housed at Bowery Arts and Science. I’m also working with the conceptual artist Beatrice Glow on various OS collaborations with her Floating Library project in September – to include a workshop on the ship, participant web content, and publication of an artists book/catalogue. As all of our magazines are, in a way, our upcoming PRINT volume, SOUND , is really a conceptual piece about what it means to publish a magazine, and an exploration of the possibilities inherent in that form in this particular time, culture, and technological landscape. It explores a return to the origins of storytelling – aural and visual – using the page as a medium in which you see the practitioner through photography and can stream audio (via QR code and accompanying audio download), instead of for the traditional text. It’s a meditation, in a way, as well, on how identity is erased via our standards of printed practice – a volume that seeks potential escape from that, exploring potentialities presented by the omnipresence of media technologies, while still loving and producing book-form. There’s more to say on PRINT too – in addition to SOUND and the Floating Library catalogue, there’s a few plays on their way to publication, an artist’s chapbook series in the bullpen, and in general an upward and outward swing where our press is concerned. It’s seen as a pedagogical self-publishing platform, in a way – a place where creative practitioners are encouraged to consider documentation through printed matter as a critical entry into their own history, as well as a way of countering and archiving what too often becomes a purely born-digital practice, guided by us in:re design, editing, printing, and distribution. But really, these are all just examples of a how a conceptual experiment happens to be reifying itself at this particular time. To get a better sense of the OS’s true scope, the next question is where it’s at. 2) On your website, you define the Operating System as an “ongoing experiment in resilient creative practice which necessarily morphs as its conditions and collaborators change.” Some of the traces of that ongoing transformation are visible in your publications. 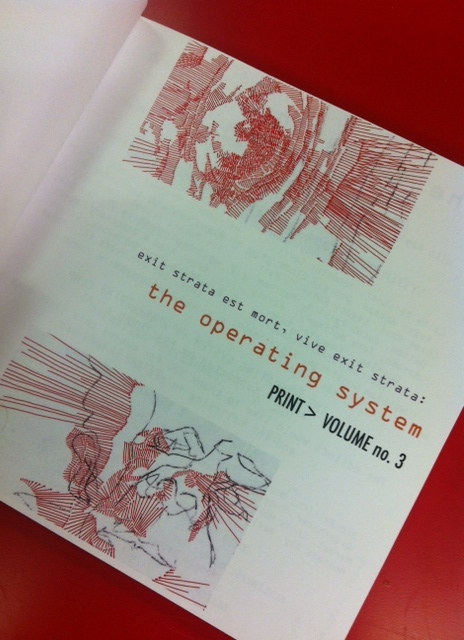 For example, each remaining copy of your publication Exit Strata is stamped with a notification that says, “Exit Strata is now The Operating System,” while the title page of the OS’s new publication, announces “exit strata est mort, vive exit strata.” Why is it important for you to foreground the transformative quality of the project? Say a little bit about the ways in which the organisation has changed over time. The Operating System enjoys a certain amount of intentional humor in representing itself via title as a fixed entity – something humans have a tendency to do, as well. The Operating System is about as fixed as you or I – it was Exit Strata, and now it’s not. I used to groan and say that I wasn’t a morning person, but now I wake up at 6 am naturally without an alarm, and it’s my favorite time of day. See where I’m going with this? We’ve had some positive (if challenging) changes in personnel which necessitated the shift of title but this potential roadblock ultimately allowed us to entirely reboot the system from the ground up, and take stock of where we’d been and where we were going. The nod to Ionesco (Le roi est mort, vive le roi) is both a reference to his absurdity and our own: we’ve died but are very much alive, in fact we’re stronger than ever. It’s really all just how you look at it. It’s important for us to be ok with the ways in which we remake ourselves, with the fact that both as individuals and organizations we try and try again to figure what exactly we “are” out – and that to be our best selves we may need to constantly shift how we’re going to go about our lives and our work. We’re adaptive organisms, as are the organizations and alliances we create. Sometimes the conditions we set are optimal, and allow for growth, sometimes we need to cut back, re-pot, and move ourselves to a better light source. There’s no shame in it, it’s the most natural thing in the world. We hope that by being transparent in our own transformative growth, others will do the same – that we’ll move as a creative community away from the shame of failure and towards an acceptance of its positive properties in making us increasingly resilient. The more we share our processes of growth and learning experiences, the more others can do the same – and learn from our mistakes. If you see all our time and money and energy as shared community currency, you start to see that it’s in all of our best interest to share our best practices (and foibles) in the interest of saving others from wasting time, money, and energy – that could better serve ALL of us in other ways. Defining the OS as an “ongoing experiment in resilient creative practice” is really the best summation of intentions for the organization I’ve found yet – whereas many businesses and organizations may be founded around a personal goal of an individual or a vision to produce a particular product, this “System” is intentionally fuzzy in its boundaries: the OS is, instead, a morphing, responsive organism which is in continuous conversation with the contemporary creative environment – and the challenges creators face therein. What that means is that I’m constantly scanning creative individuals and organizations for signs of struggle, lack, need, challenge – resources people are looking for, confusion regarding sustainable practices, our ongoing love-hate relationship with technology, et cetera — and finding spaces of conversation and resolution. What form this takes is a direct response to the particular question at hand. But ultimately it’s pedagogical: these are questions and problems that I share with all creative people and folks running or seeking to run an arts organization, as an artist/writer/creative individual, and someone running an arts organization. I have no desire to position myself as an expert — rather, I see us as allies in a mutual struggle wherein my longtime experience designing writing curriculum/teaching/working in business/being a tech geek gives me certain advantages that I’m putting to use here. I love books and book design, and I enjoy much of what I read on the internet, but I was never driven by the desire to start another press or another website – when there’s already clearly an oversaturation of input for most audiences. What distinguishes our publications – and the use of our online platform as a publishing forum – is that they are seen as, ultimately, a space of learning. The way in which we publish and work with our contributors is very much a “teach a man to fish” process (as I touched on above), intended to model the use of documentation/storytelling as a resilient practice for creative people across the disciplinary spectrum. There’s a commitment to transparency that also engages participants in all of our projects in a frank conversation about resources, ours and theirs. I’m constantly pushing the envelope in interviews to address the question of currency in all its forms, and to encourage organizations and individuals to “open source” our process learning about sustainable economic practices with each other. But I’ll talk more about that below. 3) To continue with the theme of transformations, I’m interested in the changing aesthetic of your Print Document chapbook series. The chapbooks in Series 1 partake much more of the hand-made aesthetic that’s often associated with chapbooks: they’re staple-bound, with covers made of textured paper bearing woodblock prints by Kevin William Reed . The titles in Series 2, however, are perfect bound with glossy covers. But even as you leave the hand-made aesthetic behind, you allude to that change by titling Series 2 “BY HAND,” and using pictures of the authors’ hands as cover images. Was the decision to leave behind the stapled, hand-made chapbook aesthetic a comment on the current state of micropress publishing, was it another statement of the changing identity of the OS, or both? If someone was to ask me what the aesthetic of the Operating System “is” I would say that, like the organization itself, the aesthetic is a shifting one, responsive to each project and its participants, as well as the intended environment for its receipt/delivery. On the other hand, I take the creation of a branded identity very seriously, and there is consistency in all our print publications in terms of page design, dimensions, font families, and so on. Perhaps it’s important to clarify that where both the magazine and the chapbooks are concerned, what might be perceived as a shift away from “fine” or “handmade” craft is not, in fact, a permanent one, or really a “shift” at all: it’s better understood as an addition of forms to our output. I don’t privilege one approach over the other anymore than I think one should use the same language in every context or wear the same outfit to every event: what aesthetic is chosen is partially a situational one, based on intended audience and/or collaborators on a particular project (for instance, Reed’s engagement as a printmaker on PRINT: DOCUMENT Series 1) – but can also be a practical one, when and if resources are scarce. You and I have spoken, Michael, about the (perhaps?) shifting definition of a “chapbook,” a conversation I seem to be having more and more of late, as various advances in publishing technology and personal access to technologies that allow for the production of a series like ours for (lets put it right out there) far less cost than I’ve spent making something by hand in the past. Readers might be noticing that I am not particularly interested in definitions that hold our creative potentialities back, and this one is no different: a chapbook to me is a often a first book, or a small book – a cohesive, short project that stands alone handsomely as a brief, unique volume. Whether it’s made on your own, handwritten, stapled or glued or sewn or letterpressed or screenprinted or printed at kinkos or using a publisher – who cares? It’s hard enough to be a creator without being disparaging of others’ choices or wasting time arguing definitions and semantics. I would encourage every writer or poet to practice conceiving of and organizing their own books, and certainly to try their hand at producing their own, if that prospect excites or inspires. It’s important to understand the various delivery systems via which your work may potentially reach an audience, and I feel strongly that it’s in all of our best interest if writers educate ourselves on the design languages at play in publishing and printing books and magazines. However, many people feel overwhelmed by the notion of book design – are not skilled or trained in these ways, and aren’t particularly interested in learning this at the level that they feel self-publishing requires. For this reason, our first PRINT: DOCUMENT series began with an intensive, all-day Design Charrette in which all poets participated, a model we’re working on replicating for various organizations and future publications. To answer your other question within a question, though, about whether the design decisions for the BY HAND series were a commentary on the current state of micropress publishing, the answer is a (conditional, but still hearty) yes. 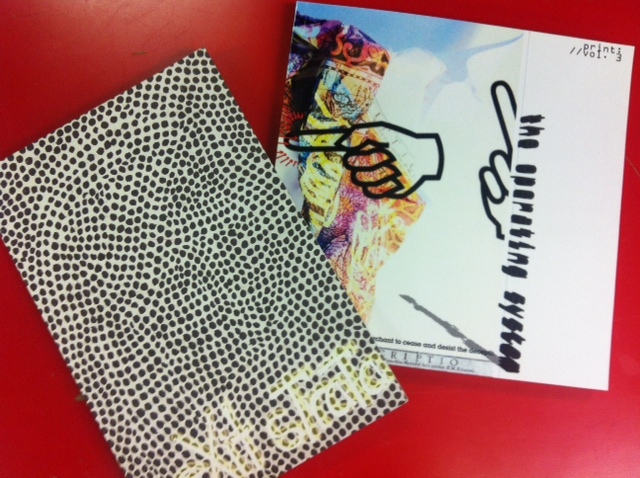 As a publisher and in keeping with the pedagogic, community-dialogue-catalyst intentions of The Operating System – there was most certainly the intention to speak directly to the slicker, technologically driven way that this series was produced while including the not-so-subtle reminder on each cover of the hand (and handwriting) of the poet whose words were inside. I’m interested in expanding our aesthetic relationship to “real” or “pure” artistic practice; when we privilege handmade books over machine-printed books, for instance, we’re forgetting the very human relationships that took place at many stages of the second process, as well. These covers are also representative of a larger question that from the outset has appeared in all our print volumes as to the ways in which photography and other modes of recording (sound and video) return us to the human, oral/aural, visual experience at storytelling’s origins – and the ways that new media is expanding our relationship with the physical page through potential interface with digital technologies. Just scratching the surface of these possibilities, we’ve included QR codes to video, audio, and other online content in every PRINT volume to date – a very clunky, perhaps questionably aesthetically pleasing choice to be sure – but more than anything one that should be understood as a nod to our commitment to the future potentialities that have yet to fully emerge. I’m also interested in reminding the reader of the very real, very personal relationship we have with our printer, Spencer Printing, in Honesdale PA, where we try to personally pick up each order, and talk to the various craftspeople who operate their print machines, both old and new. I’m thrilled to support a small, family run business who does a beautiful job on our books practicing their craft well. I have no need to own every part of the process. It’s exciting to collaborate with them, too – they’re very knowledgable and because of their scale of operation have many processes available to them that they in turn make available to us. This is true with many micropresses – the printing houses we work with are craftspeople in their own right: hands are cutting and gluing and packing these books. I love reciprocation and believe very much in functional division of labor and distribution of resources: if we can support a small business who can more easily and with wonderful, professional equipment make beautiful books for us at a lower cost than we could do with our own two hands at staples, why the hell would I not do that? Sometimes, to be frank, there’s a real snobbishness, an elitism around the preference for one form over another. Which is boring, really, not to mention problematic in:re the class issues that underlie those preferences as well as hurtful to our supposed end goal: the creation of more beautiful things, the distribution of art and writing, the support of creative people, right? (…right?) Of course what one could see as “elitism” is most likely based around deep fears regarding identity and knowledge – requiring support, encouragement and open dialogue – this isn’t meant as a dig at anyone, just a hope that we all take a deep breath and try to see the usefulness and beauty in more ways than we’ve been taught/accustomed to understanding at first flush. “I am a conduit for universal energy”: Tune in next week for Part 2, in which the OS meditates on art, entrepreneurship, and collaborative openness. 2) Is there anything you’re particularly looking forward to the publication of? 3) Are there standard titles or writers you like to recommend, either within or outside of your field? 4) Do you have a personal favorite book of all time? If so, can you share it and tell us why? 5) What’s next? Any upcoming book projects in the works that you can tell us about? I have several, and will keep you posted about them. 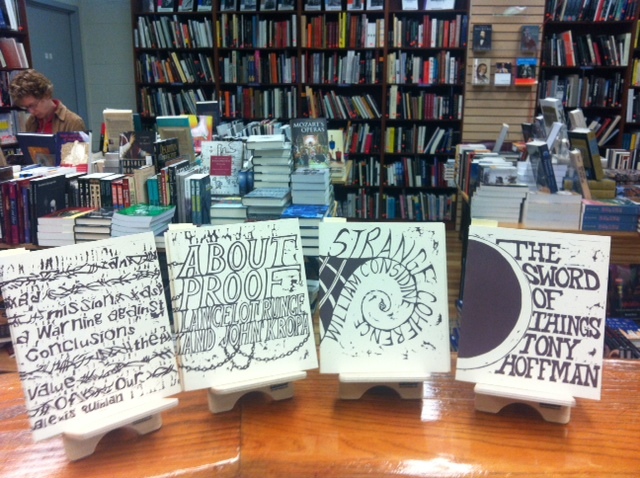 Book Culture’s Annual Spring 20% Off Sale begins Friday, May 16th and will last through Sunday, May 18th at 7pm. Everything in both stores will be 20% off, the usual restrictions do apply. All weekend we will be holding raffles to give away great prizes. Join us for a bagel breakfast Saturday morning, and a tea reception Sunday to thank all of our customers, neighbors, and friends. If you can’t make it in the store, don’t fret! That weekend the sale will also be extended to our online consumers on BookCultureKids.com, and phone orders as well. Order online or over the phone between Friday, May 16 and Sunday, May 18 to receive 20% all discountable items. 1) What would you say is the mission of the Cahiers Series in general? To that I could add that our ambition is to publish texts which other publishers could not satisfactorily put out, because the relation of words to image is too intimate and complex (as in cahier no.14 with László Krasznahorkai and Max Neumann), or because the text refuses to fit comfortably into a single genre (as in cahier no. 9 with Simon Leys or cahier no. 21 with Anne Carson). 2)How long have the Cahiers been around? Could you say a little bit about the history of the imprint? At our institution, the American University of Paris, we host a remarkable number of interesting guests and events. I came to realize after some years at the university that little trace remains of these events after they’re over. When it was proposed by our university president to start a Center for Writers & Translators, I thought it would be good to generate a publication that celebrates the many interesting people who pass through, and to commemorate the events we organize. This was at the origin, but very quickly the project became more ambitious, mostly because at that time – in 2007 – I met Ornan Rotem of Sylph Editions. It was he who gave a shape to the idea of a publication, and from the outset, with Cahier 1 by Richard Pevear, gave it a very distinguished and distinguishable layout and design. Since then we have collaborated in order to ensure that each cahier fits in with and at the same time expands the series. 3) For me one of the most impressive things about the series is simply the content. You’ve got writers like Anne Carson and László Krasznahorkai working together with artists like Max Neumann and Thomas Neubolt. You’ve even published the work of Nobel Prize laureates like Elfriede Jelinek. In one sense it seems like only a smaller press would take the initiative to make collaborations like this happen, but in another it seems like a miracle that a small imprint like yours has the resources to reach out to artists of such quality and diversity. Can you say a little bit about how you’re able to bring these artists together? The answer is to be found, I think, in the first part of your question. It is precisely because we are a small operation, because we delegate no tasks at all, that we are able to speak to the writers and artists that matter to us. One of the gambits of Ornan Rotem, from the outset, was to do precisely what big corporate publishers cannot or choose not to do: make every cahier something worth owning, something that cannot be substituted by any technological device or support. Another was to make sure that we work with artists and writers (and translators) whom we admire and trust. Daniel Medin and I have a large circle of acquaintances, and we always find a way to get in touch with artists and writers who interest us. Most cahiers take a year or two to develop, since of course, this not being principally a commercial venture, we cannot expect our contributors to drop everything just to work for us. However great the celebrity or notoriety of a writer, s/he is approachable if one goes about it in the right way. For me, the right way means as directly and simply as possible. What ensues, if there is interest, is a complex and often quite lengthy dialogue, as we see which artist might link well to which writer; and that is before we really get on to the editing side, which – because of the exigencies of the brevity that the cahier-form imposes – can be rather arduous and exacting. Then there is the designing proper, after which further discussions, and so on. What one needs for this sort of venture is above all: several sets of good eyes, a lot of editorial experience, and a good sense of what it means to collaborate. 4) What about the design of the series? What made you choose the chapbook format, and how do you go about deciding how to incorporate the art with the text? 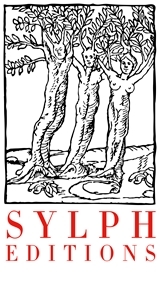 The choice of format and design is the doing of Ornan Rotem of Sylph Editions. He has explained something of his design philosophy in various articles that are available, and I would not dare to summarise it here. But you can derive its elements from any of the cahiers: clarity, consistency, design governed not by flashiness or gimmicks but by respect for the text; consideration given to every aspect of the finished work, from the colours, to the typeface, to the dust-jacket, to the choice of paper and ink, to the printing method, right down to the scent the cahiers give off when they come out of their boxes. Ornan is someone who does not like to repeat himself, and for whom design becomes interesting precisely at the point where most publishers’ designers give up: which is to say where it becomes difficult, where a new solution has to be found. An example would be, again, no.14 with Max Neumann’s terrifying Animalinside. For that cahier Ornan had to devise a whole new printing method to face the challenge of the intense black that Neumann uses. 5) As succinctly as you can, could you walk us through the process of putting out an edition of the Cahiers Series, or is each project different? At least one year before a cahier needs to appear, contact an author and see if s/he might be interested in collaborating in the series. Invite the author to submit texts that might possibly work in cahier form. Choose one or several texts and try to edit them into a shape – with the author’s help – that can fit the series. While doing this try to find an artist whose work might complement the texts; contact the artist and see if this might interest him/her; gather possible images. Begin, with Ornan Rotem and Num Stibbe of Sylph Editions, to put together the cahier in its text and image. Go through about 20 proof versions, trying to get it all right, appealing at this point too to our trusted band of readers who help us. Write the jacket and belly-band material. Print the cahier – this is all done by Sylph Editions at Principal Colour in Kent, England. Daniel Medin ensures the publicity is already working for the cahier. Ensure distribution of the cahiers through our distributor, Chicago University Press. When possible, host the author for a launch party at the American University of Paris, and on occasion organize an exhibition for the artist at our university gallery. Send out complimentary copies to readers and reviewers, follow up on reviews, give the cahier as full a life as possible. Deal with foreign publishers who would like to publish foreign editions of the cahiers. I may well have left out a few stages, since much of this has become a bit automatic by now. But what I should stress is that it all has to be done in a way that is both personal and personable. By far the most important thing to me is that author and artist be pleased both with the process and with the result. It is because this has – to the best of my knowledge – always been the case, in all the 23 cahiers published to date, that there is so much good will towards the series. And it is because we bring satisfaction that authors and artists are happy to go on helping us. 6) On the one hand we’re always reading about the death of print, yet on the other I think small presses are having something of a moment. Certainly some of the most interesting work being put out right now is produced outside the bounds of the larger publishing houses. Can you reflect on the challenges of remaining economically viable as a small imprint in what would seem to be a tough time for publishers? We have been fortunate from the outset to have the backing of the American University of Paris. The sums involved are not enormous, far from it, but the consistency of support is absolutely vital, especially when working on a project like the cahiers where the lead-time between having an idea and seeing the cahier completed can be two or three years or more. But even with institutional backing one gets nowhere unless one has an original idea to which one feels a real commitment. I really do believe that there can be more to publishing than the highly standardized forms that one sees in the shops. I was fortunate in that at just the right moment I met Ornan Rotem who was able to find a form for that belief, and for his own foresight that it was crucial to make objects that have an intrinsic value as objects, even before a reader gets going on their textual contents. I’m a little late to the party, but Franzen’s The Corrections. Also, some friends and I dug up Mac Wellman’s Brooklyn College reading syllabus and are trying to plow through all of it. We just finished the Romans. 2. Why did you choose to pair Mixtape with Adiche’s Americanah? Only because Americanah felt theatrical to me. It had been a while since I’d read a book both so gorgeous and upsetting, with a protagonist who makes you complicit in every narrative turn. 3. Are there standard titles or writers you like to recommend, either within or outside of your field? 4. Is there anything you’re particularly looking forward to the publication of? The new Marilynne Robinson and the chapbook that 826 is releasing by the students I teach poetry to at Bronx Leadership II. 5. What’s next? Any upcoming projects in the works that you can tell us about? I’m in my good friend’s short play turned short film “They Have These Really Cool Bike Planters” this coming June. I’m also working on a 10-minute about a relationship in reverse and a new full-length loosely based on snail mail, prison, and kids.